ANOTHER REPLICA OF AN ANCIENT SHIP: Replica of 2,500-year-old ship found off Israel christened ahead of maiden voyage. ‘Ma’agan Michael II’ gets set to sail down the coast from Haifa to Herzliya as part of project to crack mystery of ancient seafaring (Ilan Ben Zion, Times of Israel). HAIFA — A replica of a 2,500-year-old trading ship found off the coast of Israel was christened in Haifa Friday morning, ahead of its first voyage out of the shelter of the bay later this month. The keel of the “Ma’agan Michael II,” named after the kibbutz where its ancient forerunner was found in 1985, was laid in July 2014 as part of a joint project by the University of Haifa’s Department of Maritime Civilizations and the Israel Antiquities Authority. On Friday morning, the university and IAA poured a libation of wine to Poseidon and cast off for a quick jaunt around the bay. Later this month, however, the ship will make its maiden voyage down the coast to Herzliya, a three-day sail. I noted the announcement of the project back in 2015. Regular readers will be reminded of the Good Ship Phoenicia, a very successful reconstruction of an ancient Phoenician vessel. PaleoJudaica followed the progress of the voyage of the Phoenicia around Africa over a period of years. I wish the Ma’agan Michael II a similarly sucessful career. BOOKS, MANUSCRIPTS, AND SCROLLS: Five Best Museums For Book Lovers (Sheobi Anne Ramos, Travelers Today). For book lovers around the globe, nothing is better than being inside a library or even just a room full of books. The scent of the pages is relaxing, and spending hours curled up with a good novel in hand is time well spent. There are actually museums around the world dedicated to books, and if you're a bibliophile, these places might pique your interest. Pore over displays of original manuscripts and limited edition copies of books from way before, or just simply admire all these preserved pages and wonder about the stories written in them. Fancy going in on one? Here are some of the best museums for book lovers. I'm sure all five are excellent, but I want to flag the two with which I've had some experience. British Library, London. The British Library is more like a museum than a library, and it's because of their free, daily exhibitions of book treasures that will make your hair stand on end. Imagine looking with your very own eyes the world's earliest printed book and the original manuscript of Beowulf-it's a once-in-a-lifetime opportunity. The British Library appears frequently in PaleoJudaica posts. Some recent examples are here, here, here, here, and here. Shrine Of The Book, Jerusalem. This museum is probably one of the most treasured museums in the world, only because it holds the famed Dead Sea Scrolls, the foundation upon which Christianity was born. The museum itself is a marvel-it's designed like the jars where the scrolls are found in Qumran in 1947. The Shrine of the Book is part of the Israel Museum, which contains many marvels. A few recent posts involving the Shrine of the Book are here, here, and here. ANCIENT JEW REVIEW: Book Note | Roman Faith and Christian Faith: Pistis and Fides in the Early Roman Empire and Early Churches (Sarah Porter). Teresa Morgan. Roman Faith and Christian Faith: Pistis and Fides in the Early Roman Empire and Early Churches. Oxford University Press, 2015. Ancient Judaism also receives attention in chapter 5, which deals with the Septuagint. Many scholars, traditional and academic, believe it was worship of another god, the first commandment in the Decalogue, but what Aaron actually claims about the calf points to a different collection of laws. I agree that it is clear that the golden calf was a representation YHWH and has something to do with Jeroboam's cult at Bethel and Dan. But what exactly the objection was is less clear. My late teacher Frank Moore Cross thought that the issue was iconographic: YHWH was supposed to be portrayed as enthroned above two cherubim, not two bulls. BIBLIOGRAPHIA IRANICA: "Issue 03 – Dabir Journal. Issue 03 of Dabir, an open access on-line journal for Iranian Studies, is out now. Dabir is published by the Jordan Center for Persian Studies." There is nothing in this issue of direct relevance for ancient Judaism, but the article on the Iranian "Paradise" and the review of Richard Stoneman's biography of Xerxes are of background interest. Earlier issues of Dabir have been noted here, here and here. TECHNOLOGY WATCH: Ancient Parchments Reveal Old Texts Concealed by Newer Ones. In a sixth-century Egyptian monastery’s library, high-tech imaging of parchments reveals thousands of pages of hidden text. (A. R. Williams, National Geographic). So far the imaging has revealed some 6,800 hidden pages in 74 of the monastery’s 163 recycled parchments, called palimpsests. “We have identified erased texts in 10 languages that date from the fifth to the 12th centuries,” says Michael Phelps, the director of the recovery effort. In the example above, a text in Syriac overlays a ninth-century translation of a page from a medical treatise by the ancient Greco-Roman physician known as Galen. The inception of this project in 2011 was noted here. And for posts on other palimpsests, start here and follow the links. FREE SAMPLE: Encyclopedia of the Bible and Its Reception Online: Jewish Revolt, First (Mladen Popović, Marijn Vandenberghe). The Jewish Revolt against Rome (66–73/4 CE) was a major historical event, affecting Jewish and Roman history and the history of Jewish-Christian relations. The First Jewish Revolt proved disastrous for those in Judea: the temple in Jerusalem was destroyed, ending the sacrificial cult; some major sites were thoroughly devastated; people were killed or enslaved. The revolt and its suppression caused a disruption in Judean society and also affected Jews outside of Judea (fiscus iudaicus). This article will address (1) the sources that are available for a history of the First Jewish Revolt; (2) scholarly explanations of what happened; and (3) the earliest reception history of the revolt. Follow the link to read the whole article. For you, special deal! THE TIMES OF ISRAEL: East Jerusalem ‘modern builder’ awarded Israel Prize. Education Minsiter Naftali Bennett announces David Be’eri, the founder and chairman of the City of David Foundation, as one of the winners of the 2017 Israel Prize, considered the country’s highest accolade. Also known as Elad, the City of David Foundation is an Israeli NGO that oversees the Ir David archaeological park in Silwan and is dedicated to facilitating Jewish settlement in Arab East Jerusalem. In recent years it has helped several new Jewish neighborhoods or complexes which have sprung up in heavily populated areas of East Jerusalem, often accompanied by protests or legal challenges. Ir David itself houses about 50 families in a small community. Well, congratulations to Mr Be’eri. Elad is a controversial organization, but it has made itself a major player in Israel's archaeological scene. And the Israel Prize is a big honor. For past PaleoJudaica posts on Elad, start here and follow the links. Information on some past recipients of the Israel Prize is collected here. Jessica M. Keady uses insights from social science and gender theory to shed light on the Dead Sea Scrolls and the community at Qumran. Through her analysis Keady shows that it was not only women who could be viewed as an impure problem, but also that men shared these characteristics as well. The first framework adopted by Keady is masculinity studies, specifically Raewyn Connell's hegemonic masculinity, which Keady applies to the Rule of the Community (in its 1QS form) and the War Scroll (in its 1QM form), to demonstrate the vulnerable and uncontrollable aspects of ordinary male impurities. Secondly, the embodied and empowered aspects of impure women are revealed through an application of embodiment theories to selected passages from 4QD (4Q266 and 4Q272) and 4QTohorot A (4Q274). Thirdly, sociological insights from Susie Scott's understanding of the everyday - through the mundane, the routine and the breaking of rules - reveal how impurity disrupts the constructions of daily life. Keady applies Scott's three conceptual features for understanding the everyday to the Temple Scroll (11QTa) and the Rule of the Congregation (1QSa) to demonstrate the changing dynamics between ordinary impure males and impure females. Underlying each of these three points is the premise that gender and purity in the Dead Sea Scrolls communities are performative, dynamic and constantly changing. BIBLIOGRAPHIA IRANICA: Persianism in Antiquity. Notice of a new book: Strootman, Rolf & Miguel John Versluys (eds.). 2017. Persianism in antiquity (Oriens et Occidens 25). Franz Steiner Verlag. Follow the link for a description and the TOC. Ancient Judaism is represented in a couple of the essays. MARITIME ARCHAEOLOGY: Diving Robbers Are Looting Underwater Treasures, Archaeologists Wail. Robbing marine antiquities is hardly a lucrative business but fish aren't about to enforce international maritime law, leaving the authorities almost helpless to stop the thieves (Philippe Bohstrom, Haaretz). A few years ago, the remains of a crusader-era shipwreck and a horde of gold were found underwater, in the bay of Acre, and have now been reported. If the archaeologists had tarried, they might have found little beyond ancient rotting timbers. Diving robbers looting underwater sites are the bane of marine archaeologists. The items stolen from the sea floor, ranging from coins to amphorae to a life-sized bronze statue of Apollo to scrap metal from World War II warships, are usually sold on the black market. Worse, stopping the ravage of the ancient sites is all but impossible, the authorities admit: they can hardly post underwater guards. The problem of maritime looting is especially acute in Israel, say experts. For all the digging and looting, sometimes wonderful treasures still resurface. One day in 2013, a local fisherman, Jawdat Abu Ghrab, discovered a rare bronze statue of the Greek god Apollo in the sea outside the town of Deir Al-Balah, Gaza. The 1.7-meter-tall work weighed about 300 kilograms. With some help, Abu Ghrab extracted it from the water and put into his family's home, with the statue's male parts covered up. After some weeks, rumors of the statue spread and the Palestinian authorities confiscated it, promising to pay Abu Ghrab some fraction of the statue's value as compensation. The Palestinian Antiquities Authority for one says it's worth around $340 million, according to al-Jazeera, which could help explain why the fisherman reportedly hasn't received the promised compensation. In any case, the statue mysteriously vanished from the public eye in April 2014, though it had been in the possession of the police. Possibly looting isn't confined to thieves. It bears adding that some experts, including Jean-Baptiste Humbert, director of le Laboratoire d’Archéologie de l’École Biblique in Jerusalem, don't buy the story of the fisherman finding the statue in the sea near Egypt. The statue's color and excellent condition argue that it was discovered inland, underground, they say. Why would the fisherman lie? Possibly to avoid arguments of ownership or to avoid revealing that it was found while digging tunnels to nearby Egypt. And it's possible that it's a fake. Past PaleoJudaica posts on the discovery of the Apollo of Gaza and on questions about its real provenance and even its authenticity are here, here, here, here, and here. Dome of the Rock inspired by the Temple? TEMPLE MOUNT WATCH: 'Dome of the Rock inspired by Jewish Temple.' Archaeological findings and historical records show Dome of Rock inspired by Jewish temple. Findings presented today in Knesset (Mordechai Sones, Arutz Sheva). "The lecture is a continuation of a previous lecture four months ago when I published a finding of writings from a thousand years ago, writings from the Muslim village Nuva next to Hevron, which mentions the term Sachrat Beit El Maqdis, which translates: 'Rock of the Holy Temple'. The headline could be phrased more precisely. The claim seems to be that the builders of the Dome of the Rock were aware of traditions about the Temple and chose its location with them in mind. Read the article for details. The blueprint of the Dome itself was not based on the Temple, as might be implied by the headline. The discovery of the Hebron inscription was noted here. APPREHENDED: Antiquities thieves caught red-handed. Arabs use backhoe loader in attempt to loot archaeological site (Orly Harari, Arutz Sheva). On Tuesday afternoon an off-duty Border Police volunteer noticed a backhoe loader working on fields near the Golani Interchange. The volunteer knew the area well, and knew the field in question was part of the Horvat Mishkena archaeological site, and had been a Jewish village during the Roman period. He immediately called in supervisors from the Israel Antiquities Authority's Unit for the Prevention of Antiquities Robbery, as well as police and Border Police. The units arrived with the equipment necessary for the capture and arrest of the suspects. When the preparations had been completed, the forces entered the area while recording their findings and the suspects' movements. They then arrested five suspects from the northern Arab town of Tur'an. The suspects, three adults and two minors, were transferred to the Antiquities Authority for questioning. The backhoe loader was confiscated. Sadly, this sort of story is all too common. And those are just the cases in which arrests are made. The full scale of the looting is presumably larger. POLITICS: During Moscow Visit, Netanyahu Receives Special Gift From Putin — a Nearly 500-Year-Old Copy of Josephus’ The Jewish War (Barney Breen-Portnoy, The Algemeiner). Background here. The earlier exchange between Mr. Netanyahu and Mr. Putin let to a pointed exchange of historical reflections between Mr. Netanyahu and various Iranian officials. This didn't seem of much interest and I didn't mention it. But now that Josephus is involved, some attention is merited. NEWS YOU CAN USE: The 220-Year History of the Achaemenid Persian Empire (Dr. Rabbi Zev Farber, TheTorah.com). An overview of Persian history starting from Cyrus the Great’s conquest of Media (549 B.C.E.) until Alexander the Great’s conquest of Persia (334-329 B.C.E. ), including related biblical references and Jewish texts. NEWS YOU CAN USE: Equation for the Calculation of Scroll Length (Drew Longacre, OTTC Blog). 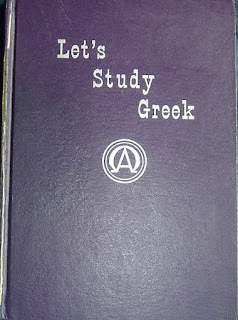 JAMES MCGRATH: Learning Ancient Greek as a Spoken Language. One of the most impressive items that I saw at SBL this year, and purchased there, is their Speak Koine Greek: A Conversational Phrasebook. It is exactly what it sounds like – a phrase book for ancient Koine that resembles the format and contents that you would expect if you’ve ever used any foreign language phrasebook before in your life. This sounds like fun. When I was in high school I taught myself Biblical Hebrew and New Testament Greek. 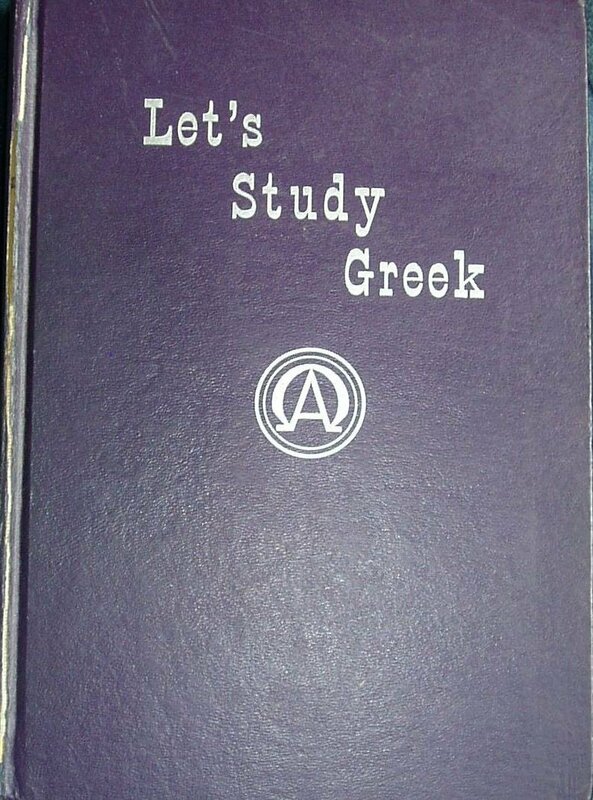 * For Greek I used Clarence Hale's introductory grammar Lets Study Greek (and my copy had that same garish purple cover). Its approach was not dissimilar to what James describes above. Rather than using passages from the New Testament, it gave the student progressively harder passages composed by the author in New Testament Greek. These were little stories with conversations and adventures. "Hi Peter." "Hi John." "How are you?" "I have a fever." "The merchant was a bad man." "The slave was wise and healed the little boy's fever." And so on. I can't find it right now, but I'm pretty sure I still have it around somewhere. I don't know whether that is the best pedagogical approach for teaching an ancient language, but it worked for me in high school. By the time I finished the grammar I could read the New Testament in Greek reasonably well. *Yes, I know. Nerd to infinity. ARCHANGEL METATRON WATCH: Drake, Elvis and Ziggy amongst BIZARRE list of names given to babies born in Scotland. HARLEY-DAVIDSON, Cleopatra and Jynxx-Blu are among the most bizarre names given to babies born in Scotland over the past year, a new report has revealed (GREG CHRISTISON, The Express). Guess which other name was registered in Scotland last year? I bet you can guess. Other unusual choices include Metatron, Ocean and Osama, while two babies were simply called A and Y, according to the National Records of Scotland. The name Metatron only appeared once. ANCIENT JEW REVIEW: Sociolinguistics and the Hodayot (Thanksgiving Hymns) (Michael Johnson). YONA SABAR: Hebrew Word of the Week: hafTarah - "haftarah" (ending). BUT HOW DID IT GET THERE? Jewish artist unearths ancient ‘star-shaped lamp’ at Maastricht fair. David Breuer-Weill recalls stumbling upon an ancient Jewish candle-holder at an arts fair in the Netherlands (STEPHEN ORYSZCZUK, Jewish News). The multi-spouted lamp found in Jericho - and, incidentally dug up by my own fair hands - was not found in Herod's Palace but in a 1st CE villa built upon its ruins. Thus it is not 'Herodian' but is dated to the 1st CE. As it was found in an archaeological context dating a similar lamp - a replica? - to the time of Herod is erroneous. Applications are invited for the post of Research Associate in Biblical Hebrew Philology in the Department of Middle Eastern Studies, University of Cambridge, beginning 1st October 2017 for three years. The holder of the post will work with Professor Geoffrey Khan on a reference grammar of Biblical Hebrew. Professor Khan has been commissioned by Oxford University Press to write a reference grammar that updates and expands the Hebrew Grammar of Wilhelm Gesenius. The new grammar will bring together the full range of diverse traditions of the language, both written and oral. The grammar will advance the field of Biblical Hebrew both by taking a holistic approach and also by presenting new research discoveries. The Research Associate will be expected to divide his/her time equally between an independent research project on Biblical Hebrew philology and working directly with Professor Khan on the production of the reference grammar. The project of the Research Associate would be expected to result in a publication that would advance the field of Biblical Hebrew. The Research Associate would be a member of the Hebrew Studies group in the Department of Middle Eastern Studies. Hebrew Studies currently includes teaching staff in the fields of Biblical, Medieval and Modern Hebrew, in addition to post-doctoral researchers, graduates and undergraduates. Follow the link for application information etc. THIS WEEK'S DAF YOMI COLUMN BY ADAM KIRSCH IN TABLET: Does the Talmud Legalize Squatting? In this week’s ‘Daf Yomi,’ putting limits on property rights. Over the last several weeks, Daf Yomi readers have explored the Talmudic laws governing the possession of real property. The rule of thumb stated in Tractate Bava Batra is that anyone who makes use of a piece of property—such as a field or a house—for three consecutive years is presumed to be its legal owner. But this formula left open a question that I have been wondering about: Does it legalize squatting? That is, does mere possession qualify as legal ownership, or does the possessor also have to give a valid explanation for how he came to own the property in the first place? If not, then anyone who was stealthy or lucky enough to usurp a neighbor’s field for three years would gain title to it, which hardly seems fair. YONA SABAR: Hebrew Word of the Week: biTTaHon - "trust (in God); confidence; security." A biblical word with modern Israeli usages. TEMPLE MOUNT WATCH: Regev, Elkin, to Establish Temple Mount Heritage Fund in Response to UNESCO (David Israel, The Jewish Press). Culture and Sports Minister Miri Regev and Minister for the Environment and for Jerusalem Zeev Elkin have decided to establish the Temple Mount Heritage Fund, with an annual budget of about $550,000, to promote awareness of the Jewish historic connection to the Temple Mount, Yedioth Aharonoth reported Monday. WILLIAM A. ROSS: NEW PHD PROGRAM IN SEPTUAGINT STUDIES (MCMASTER DIVINITY COLLEGE) (Septuaginta &C. Blog). Looks good. BIBLIOGRAPHI IRANICA: The Economy of Late Achaemenid and Seleucid Babylonia. Notice of a new book: Pirngruber, Reinhard. 2017. The economy of late Achaemenid and Seleucid Babylonia. Cambridge University Press. Follow the link for a description and ordering information. ONE MORE FOR PURIM: Haman’s Antisemitism: What Did He Not Like About the Jews? (Prof. Rabbi Martin Lockshin, TheTorah.com). YONA SABAR: Hebrew Word of the Week: pasul - "disqualified, unfit, useless." These columns have not been showing in Google searches, perhaps because of their new, uncopiable format. But I have dug up a few recent ones and will be sharing them in the coming days. READING ACTS: Reading Acts Goes to Turkey. This week I am on a short trip in Turkey, visiting many of the typical sites you might expect in Istanbul. I am obviously looking forward to Ephesus, but our short tour is packed. Usually these kind of tours overplay the “seven cities of Revelation” angle, but the group seems more interested in the Pauline studies aspect of these sites. Our guide Mark Wilson has an excellent article in the most recent Tyndel Bulletin on Paul’s second missionary journey, so I am expecting great things over the next few days. And Phil Long has one Turkey post up already: Touring Istanbul in the Rain. It includes a nice photo of the Gezer Calendar. Keyword(s): Dead Sea Scrolls, Handwritten Document Analysis, Digital Palaeography, Writer Identification, Handwriting Recognition, Pattern Recognition, Feature Representation, Machine Learning. Abstract: To understand the historical context of an ancient manuscript, scholars rely on the prior knowledge of writer and date of that document. In this paper, we study the Dead Sea Scrolls, a collection of ancient manuscripts with immense historical, religious, and linguistic significance, which was discovered in the mid-20th century near the Dead Sea. Most of the manuscripts of this collection have become digitally available only recently and techniques from the pattern recognition field can be applied to revise existing hypotheses on the writers and dates of these scrolls. This paper presents our ongoing work which aims to introduce digital palaeography to the field and generate fresh empirical data by means of pattern recognition and artificial intelligence. 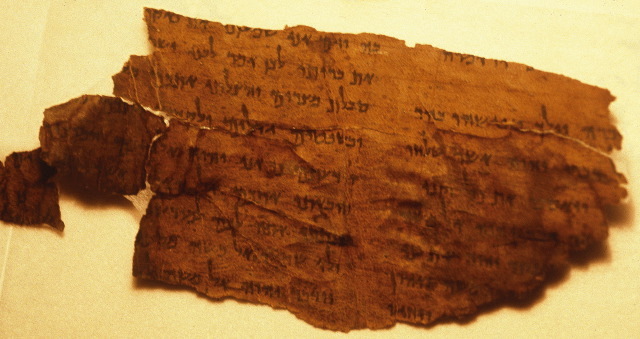 Challenges in analyzing the Dead Sea Scrolls are highlighted by a pilot experiment identifying the writers using several dedicated features. Finally, we discuss whether to use specifically-designed shape features for writer identification or to use the Deep Learning methods on a relatively limited ancient manuscript collection which is degraded over the course of time and is not labeled, as in the case of the Dead Sea Scrolls. The project was noted last year here. The Book of Revelation and Early Jewish Textual Culture explores the relationship between the writing of Revelation and its early audience, especially its interaction with Jewish Scripture. It touches on several areas of scholarly inquiry in biblical studies, including modes of literary production, the use of allusions, practices of exegesis, and early engagements with the Book of Revelation. Garrick Allen brings the Book of Revelation into the broader context of early Jewish literature, including the Dead Sea Scrolls and other important works. Arguing that the author of the New Testament Apocalypse was a 'scribal expert, someone who was well-versed in the content of Jewish Scripture and its interpretation', he demonstrates that John was not only a seer and prophet, but also an erudite reader of scripture. There is more on Dr. Allen (a St. Andrews PhD) and his work here and links. ARCHANGEL METATRON WATCH: Metatron now has his own gaming channel on You Tube. LEEN RITMEYER: The Genesis Sanctuary. As Dr. Ritmeyer observes, the idea that the primordial paradise was also a temple is old, going back at least to the Book of Jubilees. It could be added that the iconography of the Jerusalem Temple, with its cherubim, palm trees, and animals, also arguably presents the Temple as a primordial paradise.